Get tips and tutorials for the SmartRubric app, as well as inspiration for formative assessment, teaching and learning and using technology to improve learning outcomes. So, a few weeks ago I hinted in this post at some brand new features that come out of the ability to set up assessments for multiple classes at once. Well, here's one for you! This feature is available to teachers and administrators who belong to a department or school SmartRubric account (Sorry, solo teachers! You can upgrade for as little as 10 GBP/month). 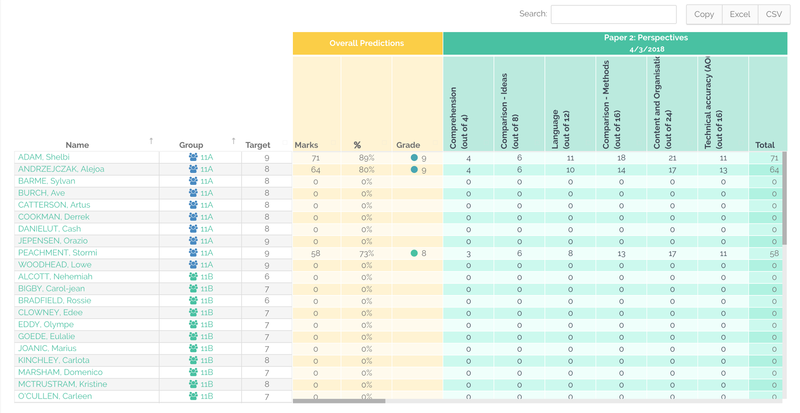 The Departmental Spreadsheet will be a familiar beast to most of you, and, to be completely honest, it isn't something that SmartRubric has been able to replace...until now. Just imagine the efficiency. You, as department administrator, can set up all of your formal assessments for the whole year (if you want! ), make a tracker like the one above and then share it with your beloved colleagues (it has a permalink). It's interactive: Want to know why little Arlo bombed question 2 on the second mock of the season? Just click on his score and be taken right into the rubric. Still not satisfied? Click on his group and get an up to date progress report for that class. It's real time: No more chasing teachers to fill in the d*mn spreadsheet. 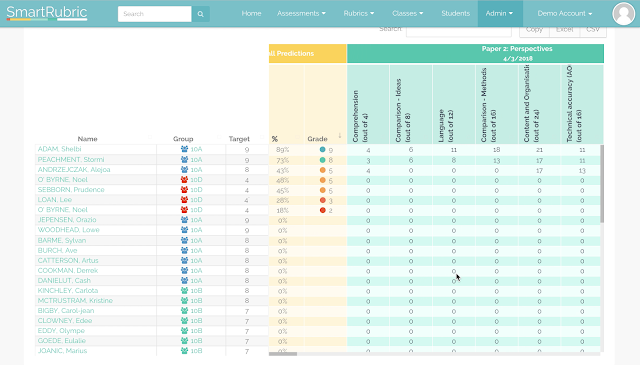 As soon as they use SmartRubric to mark, the grades appear as if by magic, in the tracker. It remembers: If you're evaluating students against a rubric that they've been marked against before (even if it wasn't for a shared assessment), you'll get a little up, down or right caret icon next to the grade that will give you a quick indication of whether the student has made progress, slid backwards, or stayed the same gradewise. Version control: Spreadsheets are lovely. I adore Excel and I think more people should too. But. How many times have you saved a departmental spreadsheet to the common drive, and ended up with an enormous proliferation of copies with names like 'Year 11 - Set B added' or 'Year 11 - MJB sorry this is so late'? Google sheets solves the version control problem but has other drawbacks. 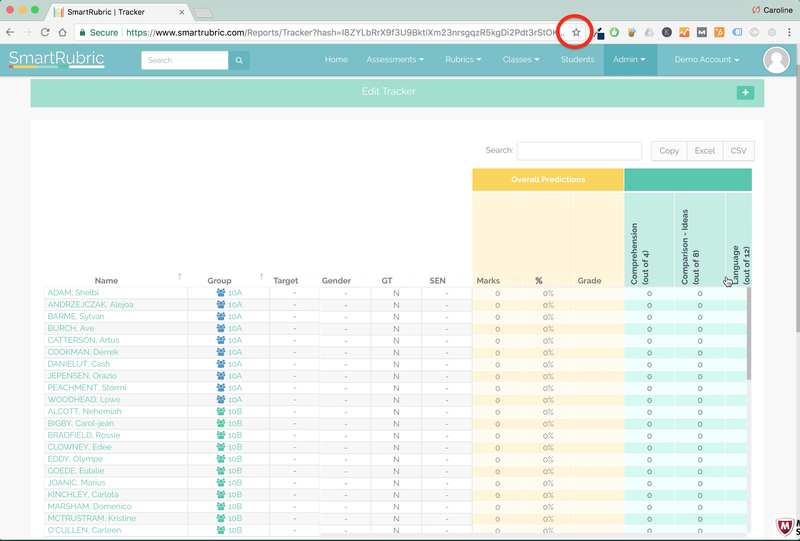 Version control is a non-issue with the SmartRubric tracker. Flags for moderation/editing: If a grade has been changed manually, the letter '(e)' will appear after the grade. Click in to see the original, calculated mark. If the grade has been moderated, you'll get an '(m)'. Don't worry -- if you (like me) want to be able to do more with your data, if your heart skips a beat at a beautifully rendered table with helpful conditional formatting, you can download your tracker with the click of a button and open it in MS Excel, or OpenOffice, or Numbers or Google Sheets and do whatever you want with it. I'm going to pretend that I'm a KS4 coordinator in an English department. There are four sets, and I want to set up a number of mock exams for all of them. The teachers responsible for each of these classes will see them appear in their Recent Assessments list. Now, I'll make the tracker. Go to Admin -> Tracker (if it doesn't appear, it means you are a solo teacher and don't have access to this feature - sorry! You can upgrade easily here). 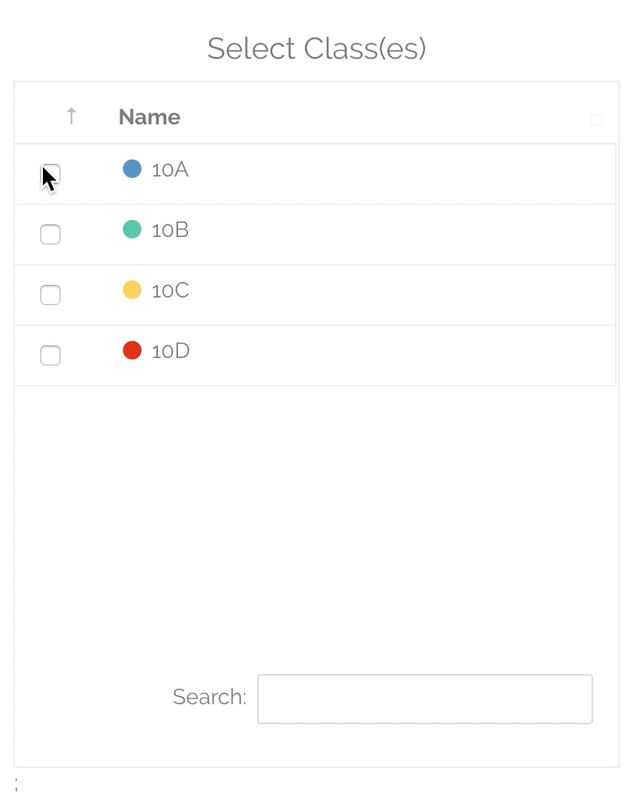 Now you'll have the option to select the classes you wish to track. As you select classes, you will get a list of available assessment. 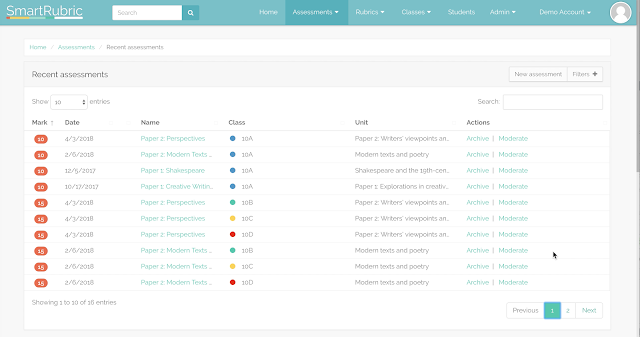 If you select more than one class, all of the assessments in the list must have been created using the 'New Multiple-Class Assessment' button or menu item (Assessments -> New multiple class assessment). This is a fun (optional) feature that let's you 'borrow' the grade boundaries from a relevant rubric so that the tracker can calculate predicted grades for your students. In this case, since the grade boundaries for all four of my papers are the same, it doesn't matter which one I pick. When I'm done, I click 'Submit'. When I'm happy with how the tracker looks, I'll bookmark it. The URL of the tracker (soz it's so ugly) is a permalink, which means that I can share it with your colleagues (this is a good time to try out the 'Messages' feature, which you'll find under your account menu). Right now, there isn't much in there, because none of my students have target grades and the assessments are all un-marked. But, as these things are added, your tracker will automatically update. As with most of the other tables in SmartRubric, you can sort and filter the tracker by clicking on the column headers or using the search bar above it. 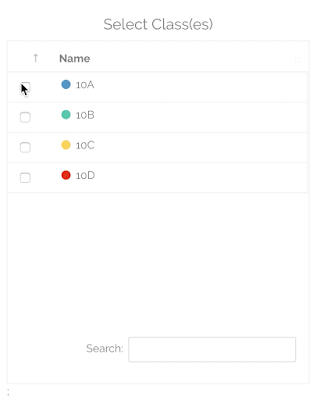 You can also export to Excel or CSV (or just copy the data to the clipboard) by using the buttons above it. That's it! I hope this makes your teaching life easier and more streamlined. 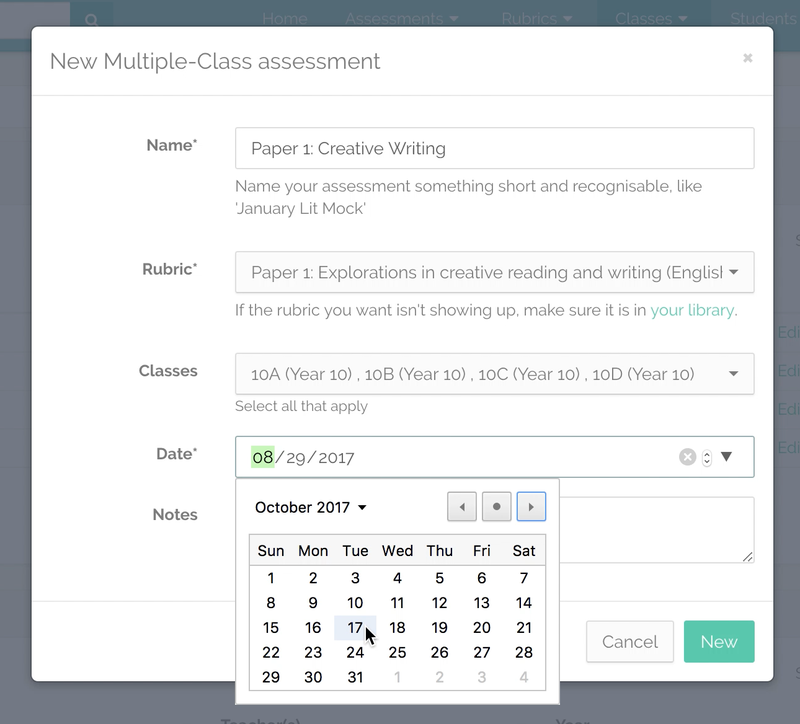 Set up your SmartRubric account, add a class full of students, build a custom rubric and create an assessment in less time than you think. I know that as a teacher, your time is really precious. Perhaps you've been putting off getting to grips with SmartRubric because you're swamped with work. I know how it goes. 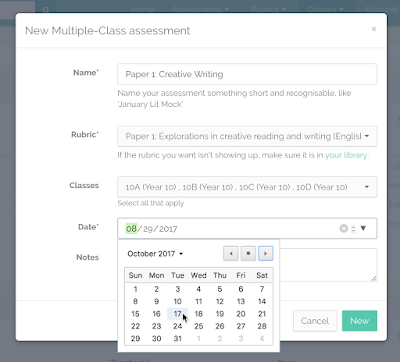 But, did you know that you can completely set up your account, create a custom rubric and start marking real student work in less than ten minutes? For a time investment of just ten minutes, you could be saving hours on time spent marking this term! I recorded a real-time video as I set up a brand new SmartRubric account. I made a rubric for an in-class English Literature assessment, but you could evaluate anything you like. All you need to get started is a SmartRubric account (get one for free here), a list of the students in the class that you would like to asses, and a clear idea of the skills or objectives for your assessment. 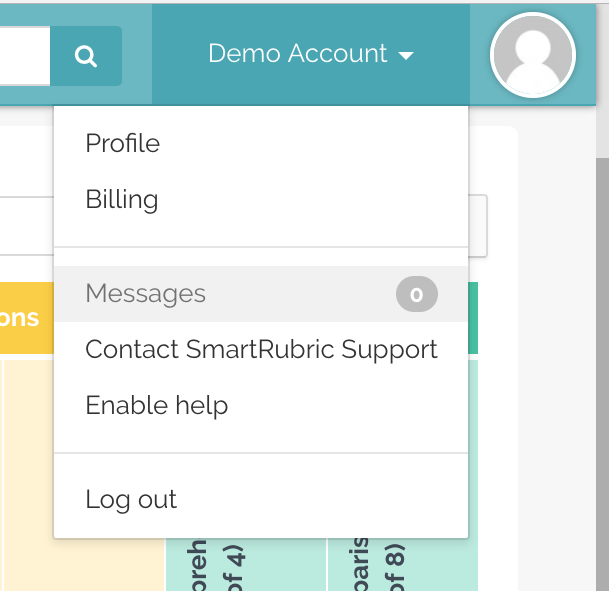 We are now ready to connect your MIS to SmartRubric via Assembly! 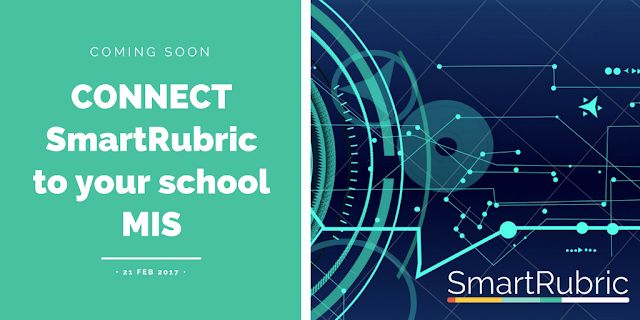 Email data@smartrubric.com to get set up. Over the next week or so I'll publish some more guidance on how this works, as well as tutorials for those of you who have already connected your systems. I'm really excited to announce that beginning in September, we plan for SmartRubric to be able to integrate with some school management systems -- SIMS, ScholarPack, Bromcom, RM Integris, Arbor and Advanced. That means that if you connect SmartRubric to your school MIS via Assembly, you and your department will be able to log in and get marking -- no need to set up classes and students! It's exam prep season, which means that sadly, KS3 probably isn't getting much love at the moment. To rectify this, I'm going to share a couple of really easy English Speaking and Listening lesson formats that take approximately zero planning and work from years 7-9, plus a couple of downloadable rubrics to make sure that you're evidencing progress. 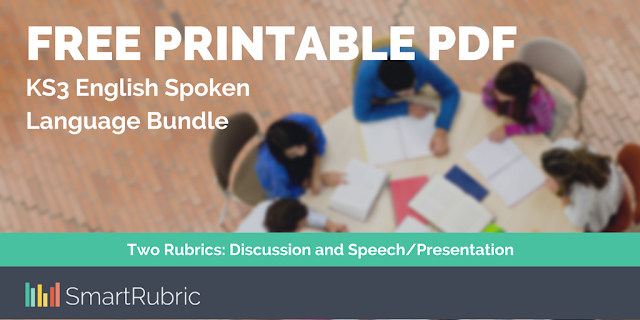 If you're just here for the freebie rubrics, I've bundled together a discussion rubric and a presentation/speech rubric. You can download the bundle here. It's aligned with the current National Curriculum expectations for KS3 English, but you could easily adapt them up or down.